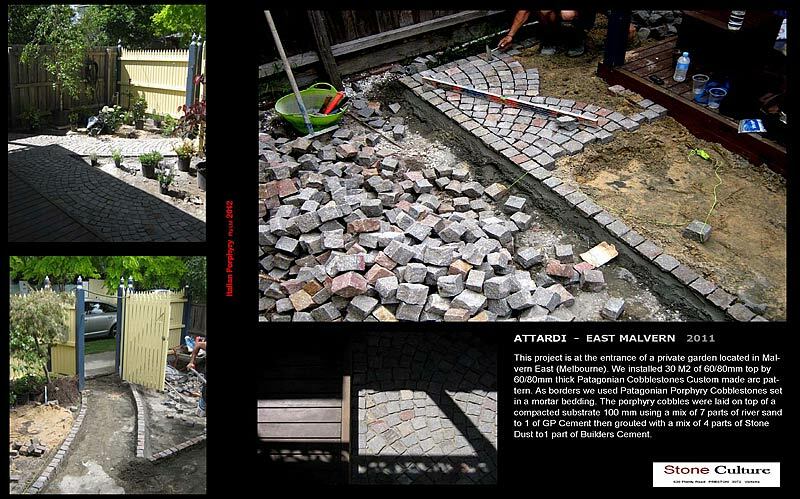 This project is at the entrance of a private garden located in Malvern East (Melbourne). We installed 30 M2 of 60/80mm top by 60/80mm thick Patagonian Cobblestones Custom made arc pattern. As borders we used Patagonian Porphyry Cobblestones set in a mortar bedding. The porphyry cobbles were laid on top of a compacted substrate 100 mm using a mix of 7 parts of river sand to 1 of GP Cement then grouted with a mix of 4 parts of Stone Dust to1 part of Builders Cement.